The Acoustic Audio by Goldwood PSC-32, black center channel speaker, pulls you into the movie action and with clean, accurate dialogue and robust sound effects. 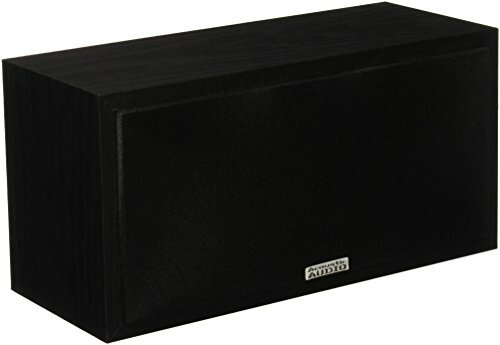 This versatile speaker also does a great job with multichannel music and video game soundtracks. Its two-way design helps it deliver clear, room-filling sound. The PSC-32 includes two 3" cone woofers which allows it to handle 125 watts of power and provide precise, powerful sound across the entire audible spectrum. The digitally tuned bass reflex enclosure fights internal vibrations that can compromise performance and a black ash wood veneer finish gives this speaker a warm, refined look, making it an attractive addition to just about any room. All of the speakers in the PS series are voice-matched, making it easy to build a system that fits your room and listening preferences.